Observation - A Mallard couple landing. - UK and Ireland. 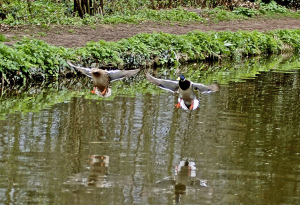 Description: A Mallard couple landing on Wey Navigation, a candle light supper for two maybe. A Mallard couple landing on Wey Navigation, a candle light supper for two maybe.